HTC One Max is going to be the bigger brother of the HTC One and it’s rumored that it will have 5.9 inch display. The giant brother is also rumored to feature a fingerprint scanner at the back. If the fingerprint is truly there then HTC One Max will become the second mobile device to feature this technology after iPhone 5S. Apple has recently announced an upgraded iPhone 5S which features all new Touch ID feature which scans user’s fingerprint to provide the required security. This means users don’t need to use PIN or any other way for the security. As mentioned before, the display size is going to be 5.9 inch and the resolution is going to be full HD for sure. HTC will go for Qualcomm’s Snapdragon 800 chipset which will be clocked at 2.3GHz. The storage inside the One Max is going to be 2GB RAM or may be HTC may introduce 3GB RAM as Samsung had already provided that much RAM storage in latest Note 3. The internal storage is rumored to be 16GB while there will be option to expand the storage. HTC will also offer free Dropbox storage for users like they did at times of HTC One. There will be LTE support along with Wi-Fi, NFC, Bluetooth and microUSB port. 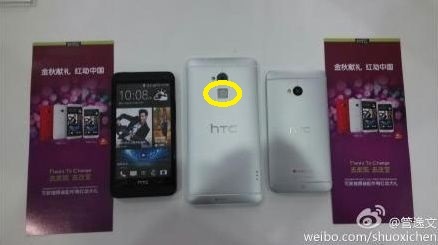 The camera technology will be the HTC’s UltraPixel which was first released with the HTC One. The giant One is going to be packed with 3300mAh giant battery and the battery life is going to be impressive as it will be running the latest version of Android i.e. Android 4.3 Jelly Bean with HTC Sense. The One Max is going to feature identical design to One but the back is going to have a unique feature that will be introduced for the first time in any Android smartphone yet. According to leaked picture, fingerprint scanner is going to lie just below the rear camera. No other characteristics of this scanner is known yet but I don’t think putting scanner at back was the right idea as it won’t be comfortable as in case of iPhone 5S where scanner is integrated right into the home button. Nothing is known yet about the release date of One Max but I’m sure HTC is planning it in this year.